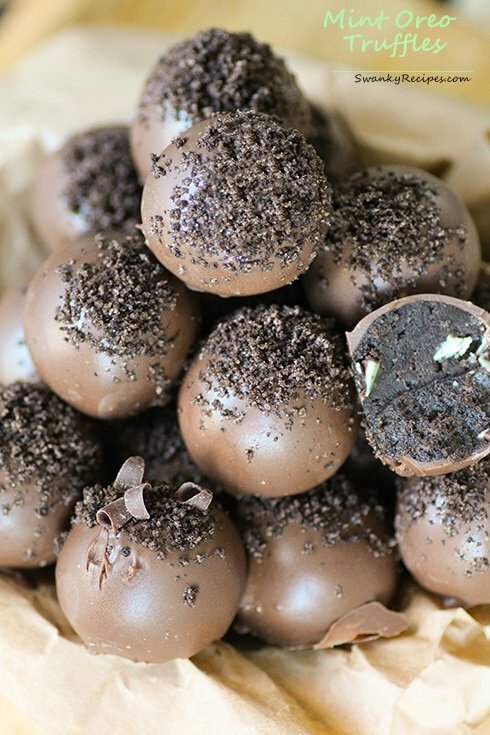 Creamy Oreo cookies cheesecake truffles coated in milk chocolate with mint chocolate chips. 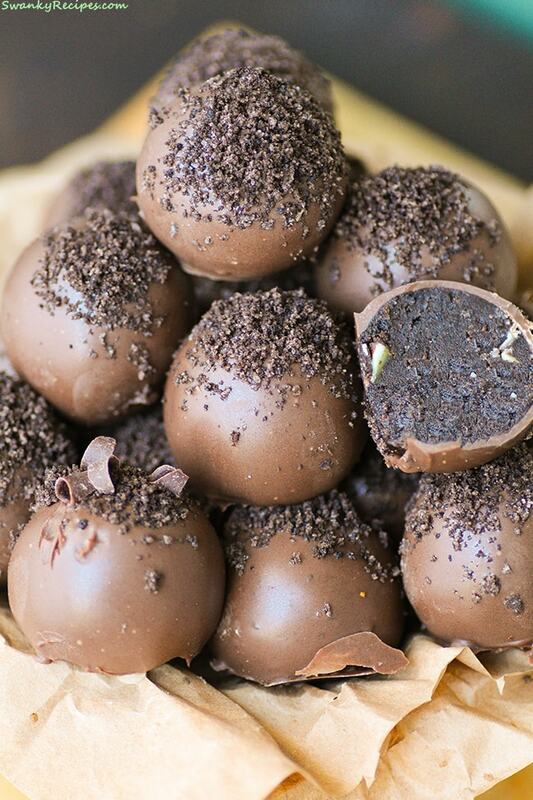 Truffles are such a fun and easy dessert to make. They are the first thing I eat on a dessert table but then again anything with chocolate is a winner in my book. To make these truffles, start by combining softened cream cheese, graham cracker crumbs, powdered sugar and vanilla extract in a bowl fit with a mixer. Allow the truffle dough to be mixed until everything is incorporated. Chop the strawberries and white chocolate finely then add it to the bowl and fold in until incorporated. Doesn’t it smell delicious? Mint chocolate is an all time favorite of mine. I’ll buy anything that combines the two together. It’s taking all my power to not walk in the kitchen and pop a few truffle balls into my mouth right now. 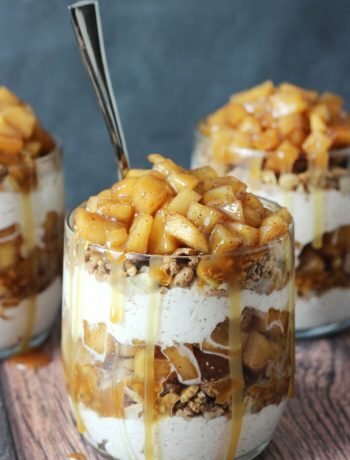 This recipe is easy to make and that makes it dangerous for me but then I remember that I’m sharing them with the family. 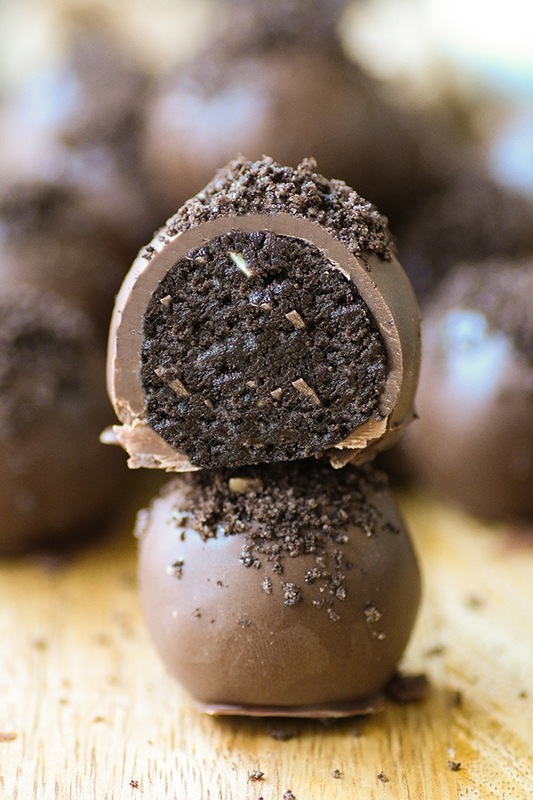 To make these truffles, start by combining crushed Oreo cookies into crumbs then combine it with a splash of almond extract, cream cheese and some mint chocolate chips. Now, try not to eat all the chocolate batter because it is tempting! Doesn’t it smell delicious? Now comes the fun part. Melt the chocolate and stir it until it is silky smooth. 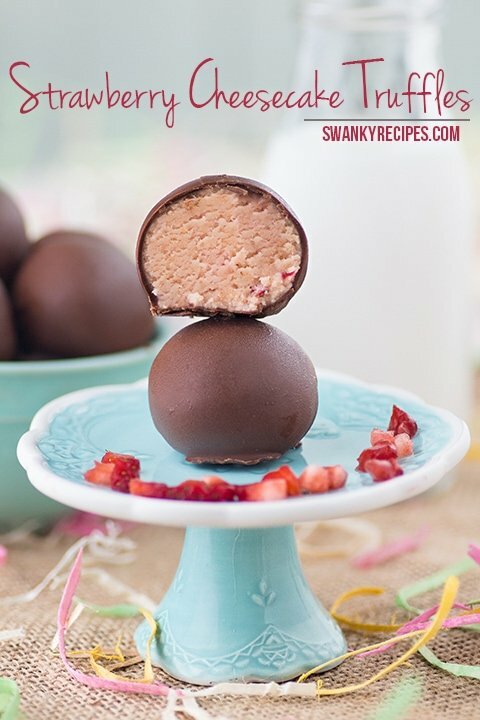 Use a fork to rest the frozen ball on and spoon melted chocolate over the ball a few times until evenly coated. Allow it drip into the bowl and add some reserved Oreo cookie crumbs to the top. Making truffles is such a fun dessert to do. The most important thing here is to make sure that the chocolate melts in the microwave at a low power level. I’ve burned plenty of chocolate in my day and it doesn’t smell good. Beyond melting the chocolate, these cookie balls are incredibly easy to make. I’ve been known to snack on truffles throughout the day. Mint + chocolate + Oreos, does it get any better? Combine Oreo Cookies in a blender and blend until smooth. Place in a fit with a mixer and paddle attachment. Reserve 1/2 cup Oreo Cookie crumbs for the topping and place the remainder in the bowl. Add a splash of almond extract and cream cheese then mix on low until a dough forms which may take a few minutes. 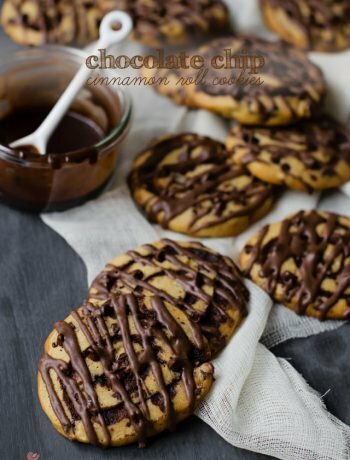 Add in mint chocolate chips. Allow dough to cool in refrigerator for about an hour. Using a cookie scoop, scoop balls and roll between hands. Place on a wax paper prepared cookie sheet (that can fit in the freezer.) Once balls are rolled, place the full cookie sheet in the freezer for about 60 minutes. Place chocolate in microwave safe dish and microwave for 5 minutes on power level 4. Power level must be low otherwise chocolate will burn. Mix chocolate until melted. 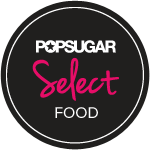 Rest a frozen ball on the the end of a fork and using a spoon, spoon melted chocolate over the ball until coated then allow it to drip into the bowl to get excess chocolate off. Sprinkle Oreo crumbs on top quickly then carefully place on cookie sheet. Repeat until done. Refrigerate in between eating. 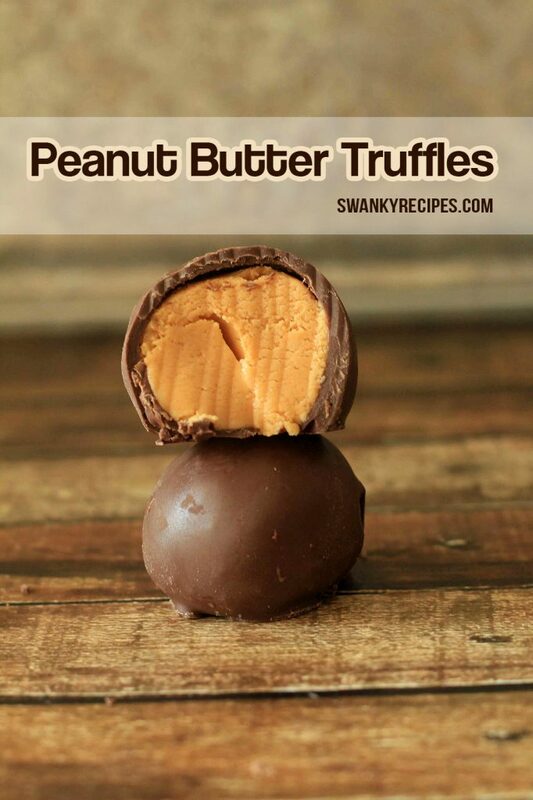 These look so yummy, truffles are one of my favorite things! 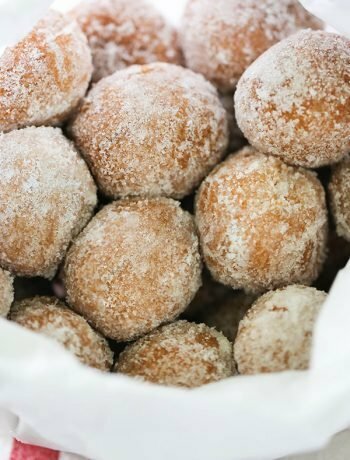 And thanks for sharing such a simple recipe, I have to make these asap!